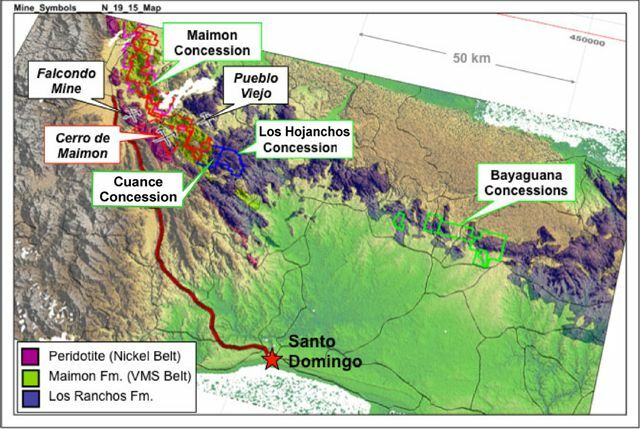 Perilya's Maimón Concession covers approximately 80% of the Maimón massive sulphide belt surrounding GlobeStar's Cerro de Maimón copper/gold operation in the central Dominican Republic. 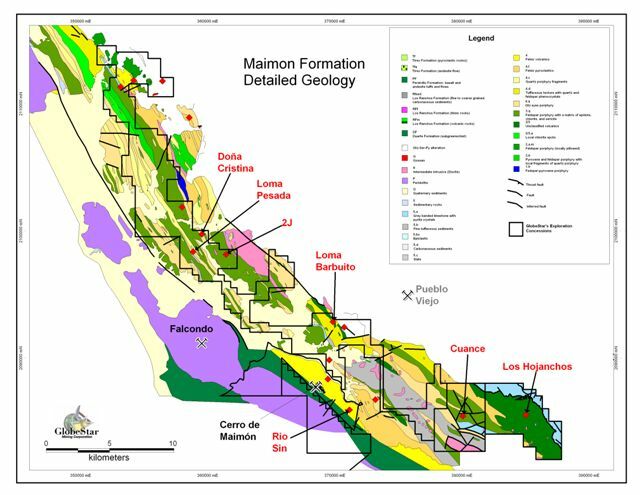 The Maimón Concession extends for over 105 square kilometers of highly prospective exploration ground and has excellent potential to host massive sulphide mineralisation suitable for treatment at the Cerro de Maimón operation. The most advanced exploration project is Loma Pesada. Perilya's systematic approach to exploring the Maimón Concession has progressed from identification of regional geophysical and/or stream sediment anomalies to establishing exploration grids over targets confirmed by prospecting and mapping. Soil and rock sampling programs are carried out on promising targets and ground geophysics is employed to identify mineralization at depth. In 2007, GlobeStar commissioned Fugro Airborne Surveys to conduct a 68 square kilometer electromagnetic/magnetic HeliGEOTEM® airborne survey that covered most of the Maimón Formation. Subsequent data interpretation has identified over 40 electromagnetic anomalies of which at least 10 had not been identified previously. Perilya has completed ground reconnaissance on the new anomalies and two scout drilling programs were undertaken in 2008. The highest density of electromagnetic anomalies within the Maimón Formation is located in the vicinity of the Cerro de Maimón deposit. The area is defined by a 5 kilometer radius around the mine. Perilya's priority exploration programs for volcanogenic massive sulphide on the Maimón Concession are within this area. It includes the Loma Barbuito prospect and is being mapped at a scale of 1:10.000. The mapping program is focused on hydrothermal alteration and the identification of hydrothermal vectors towards mineralisation. The Maimón Concession is situated in the provinces of La Vega, Monseñor Nouel and Sanchez Ramirez, about 75 kilometers northwest of Santo Domingo. The property has an elongate, irregular shape and extends for some 50 kilometers in a northwestern direction over a total area of 105 square kilometres. Access from Santo Domingo is provided by the four-lane Santo Domingo-Monte Cristi highway and the concession is covered by a network of secondary paved and unpaved roads. The Maimón Concession covers a significant part of the Maimón Formation that includes mafic, intermediate and felsic volcanic rocks, minor sediments and exhalative iron formation. The Maimón Formation is part of the Early Cretaceous Caribbean volcanic island arc system which also includes the Los Ranchos Formation. Volcanic rocks of the Maimón Formation have been deformed and generally show a regional northwest-southeast foliation pattern. The principal volcanogenic massive sulphide occurrences are the Loma Pesada deposit and the Loma Barbuito prospect, both of which correspond to airborne geophysical anomalies. Over 90 additional targets of varying priority have been identified by Perilya. The Loma Pesada deposit is a copper/zinc massive sulphide with minor amounts of gold and silver, located about 14 kilometers to the northwest of Perilya's Cerro de Maimón operation. The mineralisation is located in a shear zone, has a northwest-southeast orientation and dips to the southwest. Mineralisation is hosted by a bimodal, mafic-dominated volcanic sequence. The discovery of Loma Pesada dates from the early 1990's when Falconbridge carried out magnetic and soil surveys in the Loma Pesada area and other prospective areas in the Maimón Formation. Falconbridge completed two drilling programs on Loma Pesada, the first comprising 13 drill holes for a total of 2,680 meters in 1990, and the second, comprising 6 drill holes for a total of 905 meters in 1995. In 2008, Perilya conducted a 4,380 meter drill hole program in 34 holes in order to determine the southern and northern continuity of the known mineralized zone at Loma Pesada and to update the mineral resource estimate that was published in 2006. Loma Barbuito forms a prominent gossan located 4 kilometers north of Cerro de Maimón. Mineralisation comprises a lens of massive, fine-grained pyrite with interstitial chalcopyrite and minor sphalerite. The zone dips at 35° to the west and plunges gently to the south. It has a maximum thickness of 20 meters and is situated at the contact between a felsic porphyry and mafic/intermediate tuffs and andesitic flows. In addition, the Río Sin project, another small massive sulphide occurrence is located 2 kilometers southwest of Cerro de Maimón. The priority of Perilya's active exploration program on the Maimón Concession is to identify volcanogenic massive sulphide mineralisation targets within a radius of approximately 5 kilometers of the Cerro de Maimón operation. The area surrounding Cerro de Maimón shows the highest density of electromagnetic anomalies within the Maimón Formation The program is based on the premise that volcanogenic massive sulphide districts are generally defined by clusters of mineralisation that are related to a common heat source for large-scale sub-seafloor fluid convection systems. Volcanogenic massive sulphide districts in the Dominican Republic host numerous polymetallic (Cu-Zn+/-Pb-Ag-Au) deposits occurring along an altered marker volcanic horizon. Significant mineralized zones have been discovered and a number of gossans with coincident geophysical and geochemical anomalies have been outlined. These remain untested and indicate excellent potential for other volcanogenic massive sulphide-type deposits on the Maimón Concession. Perilya is carrying out mapping and rock sampling on a property scale and local ground geophysical (induced polarisation) and geochemical soil surveys, and trenching around HeliGEOTEM® geophysical anomalies. The results of this multi-year exploration program will be integrated into the project development plan for the Cerro de Maimón copper/gold operation since potential haul distances to the milling facilities at Cerro de Maimón are relatively short.